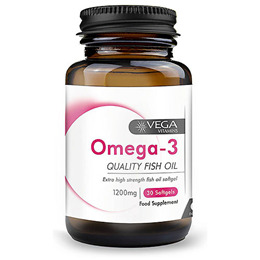 Vega Vitamins Omega-3 Quality Fish Oil is an extra high strength natural source of omega-3 EFA`s which are combined from sardine & anchovy DHA & EPA. Fish oil has a high ratio of EPA to DHA and Vitamin E. EPA supports brain and cardiac function whereas DHA forms about 8% of the brain by weight and supports brain and nervous function. The Vitamin E is used in the formulation as an antioxidant. Fish Body Oil, Softgel Shell (Fish Gelatin, Glycerol), Sweet Orange Oil, Antioxidants (Natural Mixed Tocopherols, D-Alpha Tocopherol), Sunflower Oil. As a food supplement for adults, take 1-2 softgels daily with food or as directed by a healthcare professional. Below are reviews of Vega Vitamins Omega-3 Quality Fish Oil - 30 Softgels by bodykind customers. If you have tried this product we'd love to hear what you think so please leave a review.